Many of us want a better life, but we don’t see a way to that life. Or maybe we don’t understand that we are worth living a better life than the one we are experiencing. The Hoodoo Healing Haus will allow you to love the life you live. It will provide you with the tools to master the path you desire to live. This 3 Month Online Program is broken up into 3 stages of healing. A method that the Hoodoo Queen herself has lived and thrived in. She wishes to provide the community at large with the same experience. Your entire life meaning will have a clearer purpose through cleansing, change the world you see and mastering the world you are creating. Each participant we have full and exclusive access to the Healing Hoodoo Haus Online Group, which is created on Facebook. In addition to that you will be given tools and knowledge to to create mundane change within those spaces in life that may be damaged. You will also be receive (3) 10 minute Consultations/Readings over the 3 next months as a tool of earthly and spiritual accountability while on this journey. However maybe you want more! 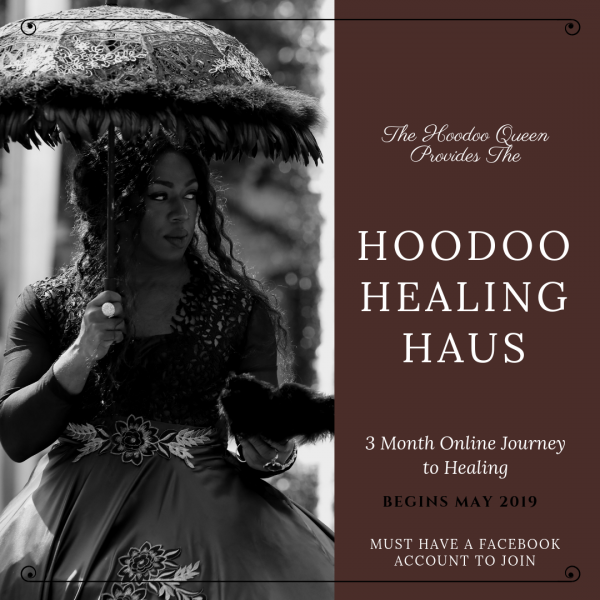 There is a Second customer choice that will allow you to receive all that is previously mention in addition to each month receiving a Co.Meadows Conjure;Hoodoo Healing Haus Box. Each Healing Box will have items to perform rituals, workings, or customs aligned with that months topic and focus. For Example you may Receive Oils,Candles, Dirts, Teas, and Incense with in a box to assist you on your road to greatness. The Monthly Classes will be Held at the Start of each Month and will be between 1hour to 1hour and 30 minutes. Last Day to Join this Healing Experience April 23,2019.